It had been mentioned on social media since the start of the week and today it finally happened. Lee Vaughan has left us for National Premier side Solihull Moors. 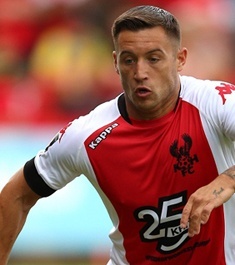 At thirty two years of age it was unlikely that he would have been offered a long contract with the Harriers at the end of the season and also being one of the higher paid players too. At Solihull he has been offered a two year contract but he will have to go part time until the Moors finally bite the bullet to go full time. With the Moors in third place and in with a good chance of promotion that may happen sooner than later. Lee joined us for a second time in June 2017 from Tranmere Rovers after he had suffered a broken leg there. He didn’t play for the first two months of that season while recovering but once back he became a fixture in the team. He was formerly with us from 2010 until he left us to join up with the Harriers new manager, Mark Yates, at Cheltenham Town in May 2014. After falling out of favour there many thought it was down to a conflict with Yates and now he has left us within a few weeks of Yates’ return there does seem to be a little truth behind it. Lee will now join up with two former members of our management team with Tim Flowers and Gary Whild now being in charge there.We wish Lee all the best and, hopefully, if we do manage to get promoted and Solihull fail then we might meet again next season.